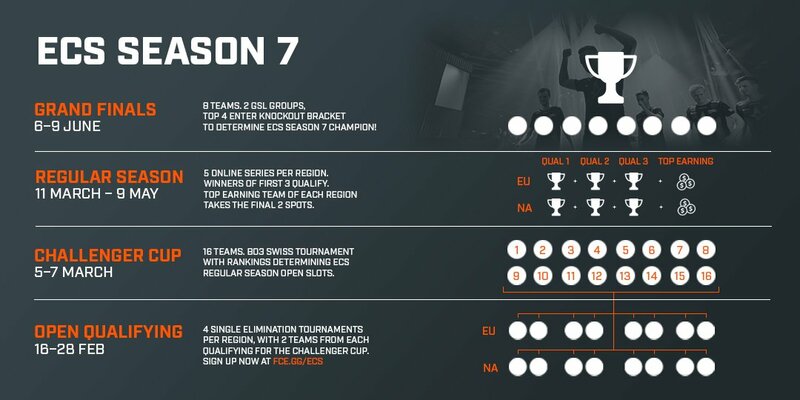 FACEIT have refined ECS, its CSGO league, for the upcoming season. Changes come after ESL reformed their Pro League. Both tournament organizers have optimized their leagues due to numerous player complaints. CS:GO’s ECS has announced a startling revamp for its seventh season. To qualify for ECS S7 Finals, teams must battle through five best-of-three knockout stages. Interestingly, ECS has only included North America and Europe in its revival. Teams like FURIA in the South American region will once again miss out. The participating teams of Season 7 – A stacked lineup in store. ECS has created their new league after discussions with players. With less of a strenuous calendar in line for them, this is an excellent move from the tournament organizer. ECS S7 will hold its finals in the Wembley SSE Arena, rather than Arlington like last season. With more regional changes in the future, ECS could mount a serious challenge to ESL. Images Via ECS and Dexerto.com.